Shakespeare showed history can be illuminated through plays. Wars, assassination, and dynastic plotting can make for exciting drama. But creation of a presidential proclamation? Where's the drama in that? Or, to put it more bluntly, Who woulda thought? Yet here it is, in 2 acts - a powerful dramatization of how Lincoln came to proclaim emancipation for most of this country's slaves in the midst of civil war. Playwright Nolan Westerfield ingeniously uses a split stage to show various perceptions of what went down in 1862, before Lincoln signed the Emancipation Proclamation on January 1, 1863. Westerfield's previous play was the short run "After Titanic," about a New York family whose breadwinner died on the boat. In that play he also used a split stage, going back and forth between the legal inquest and the Richardson family's plight in Brooklyn. The play drew Titanic fans, but closed after 6 weeks. Westerfield masters the technique with Mr. Lincoln's Proclamation. Consider these two transitions. Stage right: After two days of wrangling with his cabinet, in July 1862, over what to do about the slavery issue, Lincoln pulls out a parchment and announces he's already decided. He reads a few sentences that will proclaim freedom for slaves in all areas at war with the U.S. , then addresses his cabinet: "I will so proclaim," he says in non-proclamatory style. The scene goes dark. Stage left lights up and we see Davis and Stevens in Richmond, discussing recent confederate victories and how slavery will never go away in the states they govern. Then, just two months later, after the Union victory at Antietam, Lincoln announces his intention to the public, that he will sign the proclamation on January 1, 1863. On that date "thenceforward and forever," slaves in all rebel states will be free. That scene goes dark and the other half of the stage lights up with Davis and Stephens again. "Damn him! Damn his soul, that N-loving monster" exclaims Davis, who then rants to justify every southern action to that point. In the hands of a less-skilled playwright these confederate justifications might seem gratuitous and be tuned out. But by bringing them on immediately after Lincoln has spoken, Westerfield effectively rivets our attention - and we absorb every venomous word. Davis and Stephens make it painfully clear what they were fighting for under the guise of "states rights": the perpetuation of slavery. By creating a role for Lincoln's wife Mary Todd, we also see his personal side. There is endless speculation about how good or bad the marriage was, but no playwright could resist using her foil for Lincoln to vent his private anguish. To her he expresses doubt about the utility of the EP (but not its moral purity), about whether the Union can win the war and preserve itself, and about the loyalty of some cabinet members. Mary Todd expresses concern about their two surviving children (they had just lost their 2nd born son Willie to typhoid in February 1962); Lincoln worries about the nation. We feel for both of them. 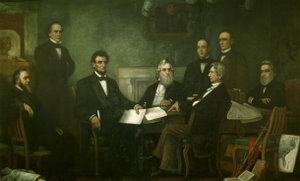 In the afternoon of January 1, 1863 Lincoln signs the document, as promised. The play then closes with a scene in the Boston telegraph office where Douglass and his followers await news of signing (there was a several hour delay before the telegram reached Boston). Will Lincoln actually sign? is the question of the hour. African Americans debate the intentions of this president who started his term in full support of slavery where it already existed (as a constitutional right) and who now has come over to their side - or has he? Douglass is portrayed as skeptical, which he was, and articulate, which he also was. Douglass wrote of that night: "we were longing for the answer to the agonizing prayers of centuries...". We don't know his actual conversations while waiting for the news, but I am inclined to accept the words Westerfield has crafted. Washington's Ford's Theater -- where the president was fatally shot -- is the proper venue for the premier of Mr. Lincoln's Proclamation. Veteran actor Henry Heinenger is so well cast as Lincoln that he likely has a lifetime role if he wants it. The other members of Ford's ensemble are excellent as well, particularly Garth Seamus McDowell as Frederick Douglass. MLP will likely play to packed houses for years to come, and touring companies will take it all over the land. My concern is that the play is so good -- and by that I mean authentic to its era -- politically correct types will kill it where it should most be viewed -- in schools. That will be a shame.